Arachnomedicine is in its infancy, but make no mistake – whilst some of our bird spiders are dying a mysterious death, scientists are working all day long to find answers. Whilst this guide provides strategies for first aid, we strongly advise you to call for professional help for the more technical interventions. Remind yourself that even good intentions may result in death if the approach turned out to be wrong. Furthermore it is of significant importance that we, hobbyists, start contributing more actively to the investigation of arachnomedicine. Report strange deaths and/or diseases, keep a log on how you treated an infected species and/or deliver the deceased specimen to professionals. Follow the instructions as given by the professional. Your contribution is in everyone’s interest and especially in the spiders’ interests. On behalf of the entire hobby, we thank you in advance. If you are a hobbyist and you have a question, contact us or join our facebookgroup. When you are a veterinarian specializing in exotic invertebrates, please contact us. We will add your region and a link on the page below. • Download THIS PAGE’S SUMMARY (pdf). • Download hygiëne plan from our friends from arachnomedicine.de. Bioactive terraria provide a soil which helps breaking down waste product. This ‘living’ soil contains microfauna, bacteria, mould, real plants, all together creating a perfectly balanced little ecosystem. Mealworms, superworms and various types of cockroaches do their part in lots of terraria. They will, however, fall as prey to our bird eaters. Isopods (Trichorhina tomentosa, Porcellio scaber, Porcellio spinicornis) and springtails (Collembola spp.) are commonly used and effective microfauna. Isopods are detrivores and browsers, meaning they feed on decomposing plants, animal parts, feces, rotting wood, leaves and a variety of fruit. Springtails are primarily detrivores and microbivores, consuming fungus, spores, bacteria and a variety of plant material. Hobbyists often refer to the little isopods as “cleaning crews”. They compete with mites for food, which is the reason why they’re a perfect addition to your enclosures to reduce the chances of mite infestation. Isopods and springtails fit perfect in warm and rather moist area. In dryer enclosures you’ll see them gather around the water bowl. • Read more about bioactive terraria. >>> Introdcution video will be added soon. Come back later. Pour fresh baking soda into the bottom of a transparent tube, which is large enough to get the spider in. Use 1 flat teaspoon for smaller specimen and 1 heaping teaspoon for bigger specimen. The lid must be airtight and screwable. Block the tube with a sponge in the middle (or paper towel if you have no sponge) and place the spider on top. Make sure there is a decent space between the sponge and the baking soda. Now prick through the lid and the sponge with a syringe and add a few drops of water (around 10) to the baking soda. Both substances will react and start bubbling. As a result carbon dioxide will be released. A silent sizzling sound can possibly be noticed. Close the hole of the syringe in the lid with strong tape and leave the spider for 15-20 minutes. The spider will fall asleep. We only recommend you to perform anaesthesia in certain cases, of which the spider’s life is in danger. Don’t do this because of the thrill. Prior to executing anesthesia, please get in contact with a veterinarian who’s specialized in exotics. Diseases and illnesses occur, especially in wild caught specimens, but the main cause of death and injuries in our cages are accidents due to impulsive fear responses, improper handling and uninformed keeping. Prevention remains better than a cure. Read our detailed caresheets and learn to understand why your bird eater is acting in a certain way. To prevent dehydration proper and scheduled feeding, a water dish and good environmental conditions are required. Bird eaters like all spiders, need to molt in order to grow. Although this process can be life threatening, it’s flawlessly executed most of the time. Especially in very old, underfed or dehydrated specimens, serious problems may occur during the molting process. The spider will internally separate its new exoskeleton from the old one during apolysis (pre-molt), using enzymes and body fluids, often resulting in a change of behavior and a potentially darker coloration on the bald spots. Environmental conditions as recommended for the individual spider, together with a constantly filled water bowl, large enough to put her prosoma in it, is proven to be of big importance. If the spider wasn’t given the requirements needed to prepare herself before and during apolysis, she might experience serious and even fatal problems getting rid of her old skin during ecdysis (molt). From the moment ecdysis started, there’s no way back. The spider is the expert, but sometimes things go wrong. Even experiencing problems, the spider will have to push herself through as far as possible. To make things clear, bad molts result in unusual consequences for the spider. These consequences may be small, severe or even fatal. An unusually long ecdysis is not considered to be a bad molt. In some cases the owner will have to intervene in order to make sure the spider lives the best life possible. As spiders are fully conscious, never disturb the spider during ecdysis, unless you’re certain only a specific intervention can save its life. Other interventions are best done after ecdysis. In various cases spiders end up with some parts of the old exoskeleton stuck on the new skin, such as an old carapace, abdomen or even a leg. However the rather innocent parts will often be removed within hours after ecdysis by the spider itself, there might be the need to help with more difficult parts of the old exoskeleton. With (a pair of) long tweezers the owner is able to carefully separate both old and new skin, especially in the leg area. In a worst case scenario the spider gets stuck inside the old exoskeleton. A surgery was performed by a hobbyist in 2012 (Journal of British Tarantula Society, December 2012, 28 (1)). Once the new skin hardens before the spider got rid of the old exoskeleton, the spider will suffer a cruel death. Severe, but solvable, are deformed legs. Leave the leg for at least 2 weeks to harden up. Then force the spider to get rid of her leg by firmly grabbing the femur of the deformed leg with long tweezers (see: How to remove a leg). The leg will poorly regenerate after one molt, especially in bigger specimens, reaching its perfect fitness after a few molts. More common are molting problems due to bad environmental conditions, leaving its marks on the new skin. If a specific specimen requiring high humidity was kept too dry for too long, the poor inner hydration might cause bad apolysis, resulting in visible post-ecdysis wounds, especially dorsally on the abdomen. Again, there’s nothing you can do during ecdysis, except for offering perfect environmental conditions afterwards if she survived. Don’t make the common mistake to put her in ICU during ecdysis and/or spray water on her, as these interventions can possibly kill the specimen. In some cases spiders end up with diseases of the cuticula due to a problematic molt. These problems often resolve themselves over time when given proper environmental conditions. Rather rare, but extremely dangerous for the spider’s wellbeing, is the loss of one or both fangs, sometimes occurring during ecdysis. If possible, the owner can try to glue the fangs of the old exoskeleton on location, after anesthetizing the specimen properly. If the spider only lost one fang and is able to eat, it helps to remember the other fang will regenerate during the next molt. Last but not least, few spiders experience a, what is called, wet molt. As the name indicates the spider’s new skin will appear wet, weak and vulnerable post-ecdysis (example 1, example2). Except for the fact apolysis wasn’t completed before ecdysis started, little is known about. The possibility your spider will survive this phenomenon is very small. Read “Gabriel, R. 2006. Wet moults don’t always mean death. Journal of the British Tarantula Society, 21 (2): 46-48.” for more info. Open wounds are mainly caused by use of bad terraria, sharp objects, collapsing structures and impulsive fear responses. Breeders often see mature males return seriously injured after an appointment with their women as well. Spiders are protected with a hard exoskeleton around the prosoma and its appendages. Except for a few spider families, the opisthosoma is weak. In order to reduce the risks of fatality with injuries on the abdomen, don’t overfeed your tarantula, don’t handle your spiders and reduce heights inside the terrarium. Compared to terrestrial bird-eaters, arboreal spp. are better equipped to survive a fall. Spiders flicking their urticating setae without hesitating, have been seen cutting their new exoskeleton post-ecdysis. Therefore, never disturb a spider in the first weeks after molt. If the spider suffers any type of open wounds and it’s treatable, bee’s wax, flour or superglue has proven to be effective. More severe injuries need to be treated in the same way, but the odds of survival are reduced significantly. A case was published in the Journal of the British Tarantula Society (March 2015, 30 (1)). A Poecilotheria metallica lost a part of the new carapace, leaving a bad open wound. The spider was put in a cricket tub. All substrate was removed to prevent further contamination. The part which had fused to the new chitin had formed a hard crust, which was removed with fine sandpaper and cut down to size. A week post-ecdysis the hobbyist was able to glue the part of the old carapace on top of the open wound. After a second molt about a year later, consequences were visible on the carapace, but the open wound was gone and the spider showed normal behavior. The term is used for haemolymph-accumulation between certain layers of the exoskeleton. In a case, published in the Journal of British Tarantula Society, March 2015, 30 (1), the spider (a Brachypelma albopilosum) suffered a strange lump (tumor) on the abdomen ventrally. These interventions need professional approaches. Contact a veterinarian. Amputation is the intentional surgical removal or the loss of a limb/body part due to an accident. Human intervention is necessary. To reduce the loss of haemolymph, further care is very important. People often close open wounds with bee’s wax, flour or super glue. Autotomy is the spontaneous casting off of a limb or other body part, especially when the organism is injured or under attack. Human intervention is possible. Autotomy in theraphosids always occurs between coxa and trochanter whereas other species of different families have been seen cutting off a leg between patella and tibia. Autotomy is preferred over amputation due to the fact it won’t leave a limb stump, as the gracilis muscle will detach and retract into the coxa. Other muscles will close the wound and help introducing haemostasis (stop bleeding). Autotomy is often performed by the spider, even if you’re trying to help the species in a rather soft way. If necessary, you might have to introduce autotomy by firmly grabbing the spider’s femur with long tweezers. Do not try to pull the leg off. The spider will do that herself. Legs will poorly regenerate after a molt, especially in bigger specimens, reaching its perfect fitness after a few molts. Defecation is the final act of digestion, in which feces are extruded from the digestive tract. Just as in humans and other animals, spiders may experience problems excreting feces due to rectal obstruction. With toxic waste stored inside the spider’s body, death is inevitable. Mainly Asian arboreal species, Poecilotheria spp. in particular, were reported victim. Exact causes of rectal outlet obstruction in spiders are poorly investigated, but a remarkable amount of the victims were quite obese. 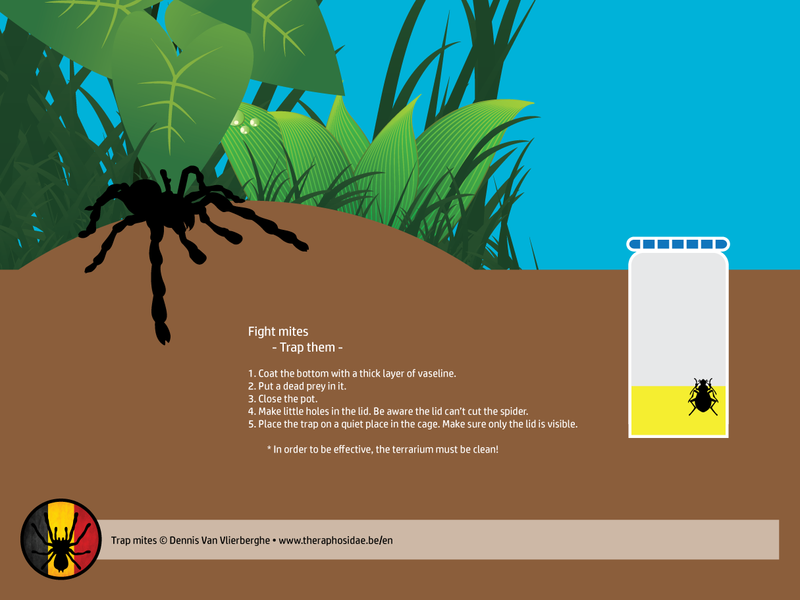 Reduce the chances of obstructed defecation by simply not overfeeding the spider (link). No scientific evidence confirms the issue, but some think certain food (like dubias) may cause rectal obstruction. Diagnosing a condition or disease, scientists tend to look for a group of symptoms. As long as a set of symptoms remain mysterious, the current condition is often referred to as a syndrome. Therefore, dyskinetic syndrome (DKS), also known as shivers, remains a set of symptoms of which the cause is still being investigated instead of a disease, as often claimed by hobbyists. Symptoms are all similar to each other, from trembling and shaking in all directions, to uncontrolled spastic movements, sometimes with such force the spider is thrown in the air. Some spiders have been seen flipping on their backs over and over again, acting very nervous as if something is itching enormously. After all these years of observation, researchers are still trying to find the cause. Chemicals (such as cleaning products, air fresheners, pesticides), mycotoxines and smoke remain in the centre of attention, together with unhealthy environments, severe dehydration and stress. The possibility of viruses and pathogens enforcing the symptoms are not to be underestimated either. As long as the cause of DKS is unknown, all possible risks need to be reduced in order to avoid it. Clear your spiderroom from chemicals of all kind, buy your prey (and its food) from reputable dealers and provide environmental conditions as close to the spider’s natural environment as possible. Keep your terraria clean, only using natural products. Bioactive cages (above) may help you maintain that. Push (and hold) the mouth parts of the suffering spider in a shallow water disk, as this is one of the only options you have (read more about dehydration in III.1). As we’re all concerned about our beloved spiders, a few treatments are going around in the hobby. However, none of these treatments have been confirmed by scientific researchers, for which reason we don’t recommend any of the listed treatments until scientifically proven effective. Contact a local veterinarian and follow his instructions. Hand the deceased spider over to scientists for further investigation. Heat treatment – The spider is given temporarily extreme heat, up to 50°C. Bathroom treatment – Place the entire terrarium in the bathroom, while running a hot shower until the whole room gets steamy. Repeat until the symptoms have gotten better. Also referred to as ‘dystocia’, ‘egg-retention’ or ‘post-ovulatory stasis’. Egg binding, however, is the issue of the egg(s) not passing the ovulatory system at a normal rate, whereas dystocia includes the problem of laying eggs due to obstruction. The problem is common in birds and reptiles (mainly snakes and turtles), but rather rare in spiders. Exact causes of egg binding in spiders are still unknown, but poor conditions of the mother (due to age, malnutrition and/or environmental conditions), lack of a decent hide, sudden disturbances during oviposition, anatomical defects or malformed eggs are possibilities. Birds suffering from egg binding are often given higher humidity and temperatures, a constant access to water and an injection of oxytocin, arginin vasotocin or smeared with prostaglandin gel to induce reproductive traction. Let’s do this in spiders as well, you might think, but these treatments cause contractions of the reproductive tract, which is lacking in spiders. As a result, death is inescapable for spiders suffering from egg binding nowadays. Once again it all comes down to proper keeping, respecting the spider’s lifestyle and providing the best environmental conditions, good nutrition and a decently built terrarium. As this is a rare condition in spiders, make sure you hand the perished spider over to a specialized veterinarian for further investigation. Bacteria are all over the planet. Some live in symbiotic, others in parasitic relationships with plants and animals. However little is known about the microbial flora in- and outside a spider’s body, Bacillus spp. have been proven opportunistic but effective pathogens on spiders. Intense infection may lead to death. Make sure your spiders are given optimal conditions in which they develop maximum strength and immunity. Effective usage of antimicrobials remains to be investigated and/or published. More investigation needs to be done in order to give you a proper answer to this kind of viral infections. Fungal infections come in two different types. An entomopathogenic fungus is a fungus that evolved to exploit and parasitize insects (or arachnids). Infected spiders won’t show any sign of infection, except for a short period of anorexia. Only further investigation will determine the exact cause of death. This type of infection is mainly brought into the spider’s cages through infected insects. Ophiocordycipitaceae is a family of arthropod-pathogenic parasitic fungi, mainly darkly pigmented with significant apices. Don’t confuse them with the rather common yellow mushroom, Leucocoprinus birnbaumii. Ingestion of this last mushroom may cause serious digestive reaction, neurologic reactions and even death in smaller animals. Remove the mushroom as fast as possible, as the spider may be infected by drinking from an intoxicated water bowl. Don’t change lids, as you might help the spores spread (BTS; May 2008, 23 (3) page 79-83). Less severe, but mainly caused due to bad husbandry, is the opportunistic growth of saprophytic fungi on the spider’s body. Extremely moist substrate, poor ventilation and/or very poor hygiene inside the cages are at the fundaments of infection. Acting in the opposite way is obviously reducing the chances of infection (read about bioactive setups). Clean the infected area daily with a cotton swab, containing a weak povidone-iodine solution (like iso-betadine). Treat the fungus before it got through the exoskeleton. Once it got through, you’re too late. To prevent fungal infection of fertilized eggs, please take the cocoon from the mother and incubate the eggs. Be advised incubation is not recommended for all species. To know whether or not you’d better deprive the cocoon, read our caresheets carefully. Once the cocoon got infected with fungus of any kind, remove all infected eggs from the healthy ones and incubate only those. There’s no way you can save the infected eggs. • Diversity of the entomopathogenic fungi: Which groups conquered the insect body? Mites are very small arthropods which are closely related to ticks. Larvae have 6 legs. Adult mites have 8 legs. Certain types are parasitic, others are saprophytic, but most mites in our terraria are phoretic. Phoresy is the act of one animal using another species exclusively for transport. Phoretic mites with a necromenic lifestyle ascend the host and develop on the spider’s carcass. Parasitic mites, from a variety of families, are often parasitic during larval stage, turning into free dwelling predators as adults. They are harmful to plants and animals. When parasitic, they’re mainly found on the legs. Infection is most of the time easily detected by their red coloration. A saprophytic mite’s diet consists of traces of organic matter, such as fungi, bacteria and plants. Infestation can be detected by discoloration of leaves or leave drops or simply by see them walking against the glasses. Some saprophytic mites produce webbing and silk like spider mites. Weakened spiders might show lots of mites around the book lungs, but further inspection is necessary to be sure. As phoretic and saprophytic mites need warmth and humidity to survive, they will position themselves around the spider’s mouth parts and book lungs. Showing up in high numbers they might complicate the spiders’ breathing. As we are really concerned about our spiders’ health, plenty of ideas to fight mites are going around. Some swear by removing them with a soft paintbrush dipped in olive oil (which may stuff the spider’s body openings) or a soft brush with a touch of alcohol, others place wormwood around the cages, freeze or bake the substrate or immerse the spider in water for a few seconds. All these interventions, however, remain intensive for both spider and keeper. Furthermore, success rates are uncertain. Beekeepers use oxalic acid to fight the external parasitic mite Varroa destructor. They’re a real pest there, as they can only reproduce in a honey bee colony. This method, however, remains a no go in our spider cages, as our spiders themselves will immediately fall victim to the acid. According to a reputable Belgian beekeeper, the use of thymol (a natural constituent of honey), used to disinfect hives, might be worth trying in our enclosures. This is sold as strips, named thymovar or apivar. Nature wouldn’t be nature without offering a perfect solution. Predatory mites, such as Hypoaspis miles and Phytoseiulus persimilis are free dwellers that feed on insects, nematodes and other soil organisms. By temperatures from 15-28°C they’ll hunt down, kill and eat every prey mite nearby. Once all prey mites died, the predatory mites will die a silent death. After 6 weeks of food shortage no predatory mite will go on an evening trip. Temperatures above or below the recommended scale, will make all mites go in resting mode. As mites die below 5°C people often freeze the substrate, although proper cleaning and a clean tank after a treatment with predatory mites should do the job. Maybe you might like to outsmart a few of them (photo)? Please note that prevention is always better than a cure. Keep your cages clean of leftovers and dead animals. If possible, reduction of humidity is recommended. As mites create hotbeds in warm and humid areas, repeatedly overflowing the water bowl without checking the substrate underneath is not the best idea. Clean the excreta from the windows and buy your prey only from reputable dealers. Add sow bugs and springtails in your rather humid cages. • Mites parasitic on spiders. • Phoretic mites associated with animal and human decomposition. • Necromenic lifestyle of Histiostoma polypori (Acari: Histiostomatidae). Phoridae, commonly known as humpbacked flies, coffin flies or scuttle flies are easily confused with the rather harmless fruit flies, but this minor mistake can cause major problems for our arachnids. 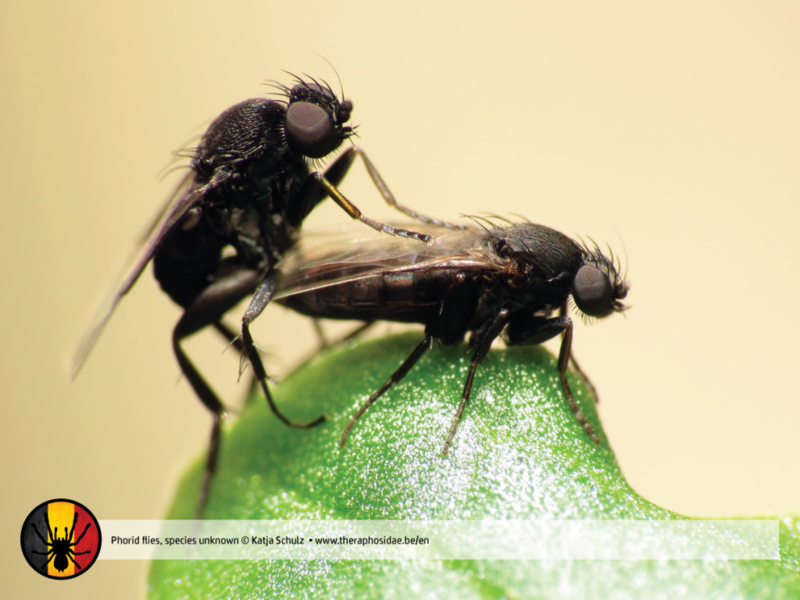 Phorid flies are black or brown, sometimes yellowish. With body sizes between 0,5-6 mm they are very small. In contrast with the red eyes of fruit flies the eyes of Phorid flies are dark colored. The arched thorax of adult specimens give them a humpbacked appearance, which explains where they got their common name from. Phorid flies are believed to be primary vectors for spreading fungal, bacterial and viral diseases, mites and nematodes. Larvae of some species, such as the in our terraria most commonly found Megaselia scalaris, feed on a variety of moist and decaying organic material, carcasses and food leftovers included. In worst cases they’re found in external wounds and digestive tracts of animals. It is believed deaths of numerous specimens in our terraria are caused by infection of Phorid larvae. Remove infested area as soon as possible and avoid further infestation by keeping your cages clean on a daily basis by removing all carcasses and leftovers. Rehouse the spider if the infestation was too intense. Add fly traps and/or place carnivorous plants close to your terraria in order to outsmart a lot of the adult specimens. Avoid Phorid flies from entering the cages by adding Phorid-proof nets over the air holes, especially when you’ve found one Phorid-infested area and/or nematode-infected tarantula. A little bit more sophisticated, but not too difficult, is the Phorid fly trap which is often used in bee hives. Cut a slot in the side of a tube with a hot knife. Make a mixture with native honey, water, pollen and only one drop of soap. Leave the tube with the mixture in the sun for a while. • Scuttle flies: The Phoridae. 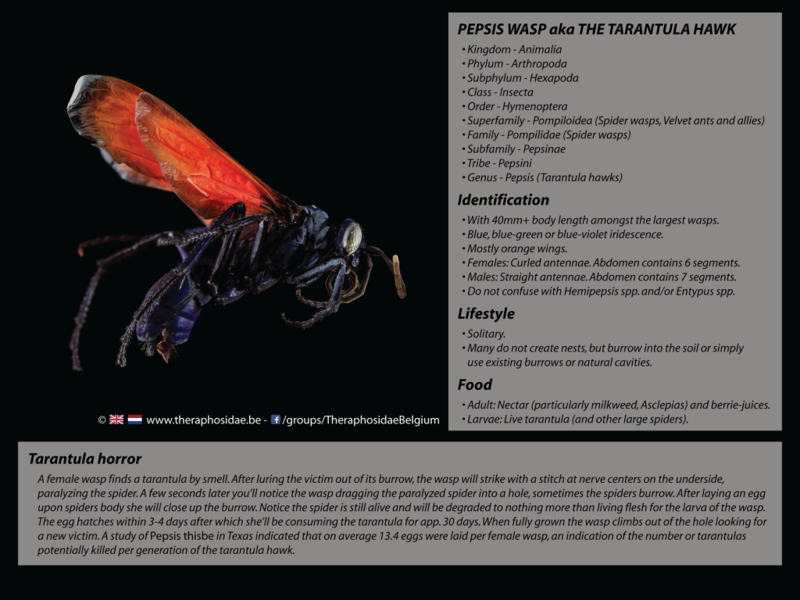 Acroceridae, commonly known as spider flies, are named as such because the fly’s larvae parasitize spiders. The flies are quite large, hump-backed, rather rare and live in semi-tropical area. Many species mimic bees, wasp or beetles. Larvae make their way into the spider’s body through the book lungs. Plural larvae can parasitize one spider. Once a larva reached fourth instar, it will start consuming the spider’s opisthosoma from inside out before erupting to pupate. Death as a result is inevitable. Especially wild-caught specimens were victimized. Destroy the pupa before the fly emerges. • Jewelled spider flies of North America: a revision and phylogeny of Eulonchus Gerstaecker (Diptera, Acroceridae). The term is used as a non-technical reference for flies’ larvae. We often find them in sizes below a cm, but they can grow twice as big. After 3 to 5 days of feeding the flies’ larvae turn into puppets for 2-5 weeks after which they morph into flies. Maggots need to eat continuously which explains why they’re always found near old or rotten food, dead animals and other breeding grounds. The best prevention is a clean cage of both spider and prey. Besides the flies laying eggs in prey leftovers or dead animals inside the cages, maggots find their way towards your spiders’ cages through prey as well. Healthy prey, kept in proper conditions, is from significant importance. Beetles from the family Histeridae feed themselves on Diptera maggots, but they can harm your spider. Just use long tweezers and remove the infected area. If the infestation was too bad, rehouse the spider and clean the tank entirely. The possibility captive spiders have to deal with wasps, is rather small. A theraphosid from the family of the Harpactirinae (Harpactira pulchripes) survived a sting from a wasp after intensense manual treatment from dedicated hobbyists. Nematodes are multicellular, often microscopically small thread-like worms. The word “nematode” is derived from the Greek word “nema”, which means “thread”. However they are structurally simple, it is believed this is due to simplification of ancestral organisms and not necessarily an indication of primitive origins. Some nematodes feed on fungus, bacteria or plants, where other nematodes are carnivores or omnivores. Most nematodes in our environment are not parasitic, but all them are very important to maintain a healthy ecosystem. In fact, the incidence of a certain nematode is sometimes used as an indication of environmental quality. This being mentioned, nematodes are often reported as parasites and associates of invertebrate animals as well. Arthropods, including our beloved spiders, often fall victim. Some nematodes are zoonotic, meaning they can infest vertebrates, like humans. • Phylogenetic and functional classification of nematodes. Many of the Panagrolaimidae (phylum Nematoda, order Rhabditida, sub-order Tylenchina) are bacterial feeders. These nematodes can be found in a big variety of places, are quite small (0,5mm-3mm) and can survive extreme conditions, such as extreme cold or dryness. In our terrariums, nematode infestations are more extreme in the rather good ventilated humid cages. Infections of Panagrolaimid nematodes have been reported in both wild-caught and captive-bred species, always restricted to the area around the mouth parts and are often associated with bacterial infection of surrounding tissue. Once infested, the spider will initially show symptoms of anorexia and lethargy. It is possible the tarantula will spin a lot more silk and be unstable on its feet (BTS; February 2007, 22 (2) page 50). Check for infection with a magnifying glass or perform anesthesia as shown above, flush the mouth parts and microscopically investigate the liquid with a drop of saline to diagnose infestation. Sterilise the mouth parts with a drop of alcohol. During the later stages of infection, a thick white bundle of nematodes can be seen around the mouth parts and between the chelicerae. As Panagrolaimid nematodes are closely related to parasites on beetles, it is supposed infestation may as well occur by feeding mealworms. Avoiding this nutritional source is recommended as long as the infestation lasts. Even worse is the presence of Phorid flies during nematode infestation. It is believed that Phorid flies transport nematodes over multiple terrariums. Infected species need to be put in quarantine (isolation) for at least a month. Protect your rare species and/or gravid females by putting them all in quarantine separately. Inspect the mouth area in a way as described before, before you decide to make her leave quarantine. Don’t replace surviving prey from one cage to another. Protect yourself at all time with gloves and intensive hygiene. In case of infestation (or serious doubts), always contact a veterinarian and follow the instructions. Disinfect everything (tools included) intensively with hot saltwater, unless your veterinarian says different. A successful treatment was published in the Journal of the British Tarantula Society (February 2007, 22 (2)). Primary to treatment he flushed the mouth parts and sterilized the area with a drop of 98% alcohol. Starting from the idea nematodes become inactive below 12°C and die above 36°C, the owner kept his infected species isolated in a polystyrene box (tilt the box slightly) for 5 days at 38°C. In the meanwhile he provided fresh water 2 time daily and he kept the boxes clean. After 5 days in extreme heat, he left the spiders for 10 days at 22°C, followed by a second 5 day period of 38°C. 4 months later 1 spider died (Grammostola rosea, which sp. is known to prefer rather cool environments), reasons unknown, but the other 6 spiders survived and remained symptom-free. There’s no scientific report confirming the effectiveness of this treatment. In september 2016 a hobbyist treated specimens with Noromectin, 1,87 Ivermectin oral paste for horses. Unfortunately, he had to euthanize 1 of his spiders, with the claim severe internal damage was caused by the parasites. Another infected spider, a sub-adult Xenesthis sp. blue, was symptom-free after 10 days and was given a second dose 3 weeks later. Surprisingly he claimed the spider was fully restored after a month, properly catching prey and showing normal behavior (link). Mermithidae (phylum Nematoda, order Mermithidae) comprises a group of parasitic nematodes with developmental hosts in Arthropoda and Mollusca. They are often confused with horsehair worms (Nematomorpha) and vice versa. Unlike Nematomorphae, Mermithid nematodes don’t have a terminal cloaca. Most Mermithid nematodes are recorded from insects and, to a lesser extent, arachnids. Infection is probably caused by ingestion of infected prey. Mermithidae are quite uncommon in our cages. Especially wild-caught specimens have been recorded. As the worm grows inside the spider’s body, the opisthosoma may be enlarged and/or deformed. In some cases the parasite is visible through the cuticle. Pedipalps might be malformed and legs might be remarkably shorter. Infected animals were often seen behaving strange, especially looking for water. Buy your prey from a reputable dealer. Don’t feed wild-caught prey, as the chances are higher they might be infected with parasites. • Mermithid parasites of spiders and harvestmen. • Heydenius araneus n. sp. (Nemathoda: Mermithidae), a parasite of a fossil spider, with an examination of helminths from extant spiders (Arachnida: Araneae). Nematomorphae (phylum Nematomorphae) are parasitoid animals, similar to nematodes, mainly found in damp areas such as rivers and streams. Adult worms are free living species, but the larvae parasitize arthropods. With sizes up to 2 meters, some Nematomorphae can grow quite large. Treatments prioritize defecation of parasites, followed by the injection of a solution of saline in severely dehydrated spiders. As these interventions need professional approaches, contact a veterinarian for further inspection. • About wet moults: Gabriel, R. 2006. Wet moults don’t always mean death. Journal of the British Tarantula Society, 21 (2): 46-48. 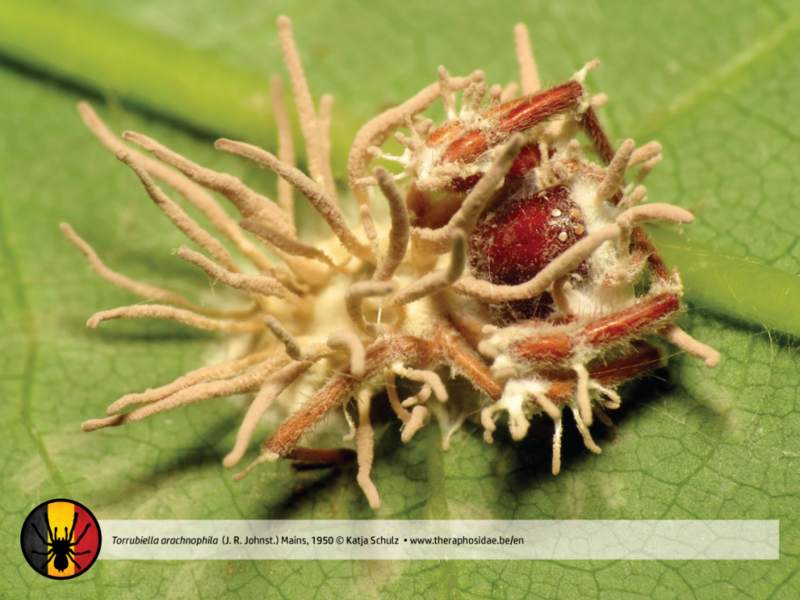 • About open wounds: Journal of the British Tarantula Society (March 2015, 30 (1)). 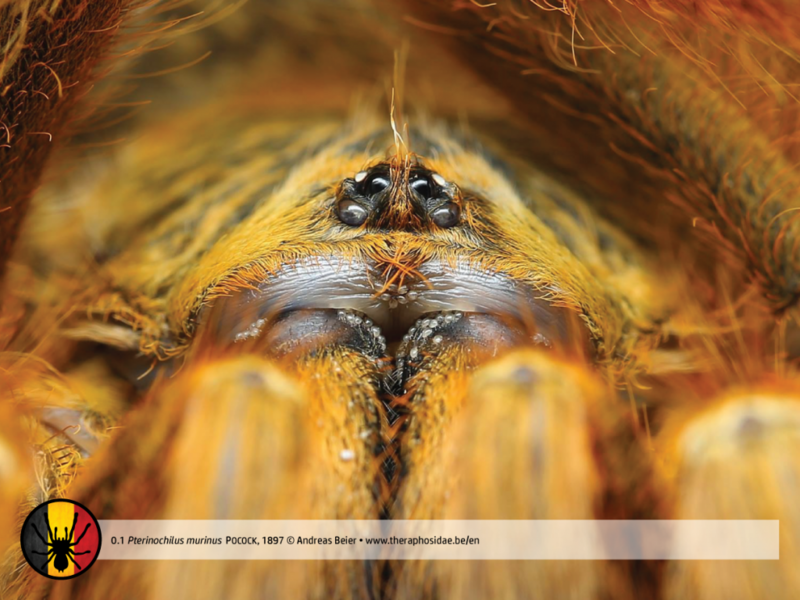 • About abdominal hernia: Journal of British Tarantula Society (March 2015, 30 (1)). • About Panagrolaimidae: Journal of the British Tarantula Society (February 2007, 22 (2)).  • Medical insects and arachnids. Special thanks goes out to Mark Alexander Eichelmann (arachnomedicine.de), Milos Anic, Patrick Meyer (poeci1.de, facebookpage), Sam Luyten and Danniella Sherwood. Thank you for your time, work and patience. Thank you for sharing your knowledge and experience.